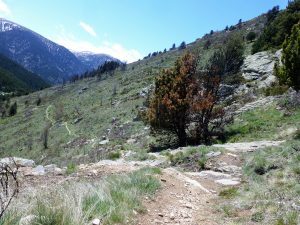 In discovering and walking Virginia Hall’s trail through the Pyrenees, I couldn’t help but imagine Virginia inching her way up steep, snow-covered slopes with her prosthetic left leg, “Cuthbert,” dragging behind her. I thought of her other challenges, too: a guide, who was willing to leave her in the snow; the Gestapo, chasing her from behind, and the uncertainty of what lay ahead. Then I understood what it took to make this climb, her immense mental strength, determination, and perseverance, and saw Virginia as she was, a remarkable, differently-abled woman. After days of traversing the icy Pyrenees–trekking more than twenty miles in rugged, unforgiving terrain–Virginia crossed the border into Spain. Mentally and physically spent, she made her way to the train station, the final leg of her journey, where she planned to take an early morning coach to Barcelona. I’m sure Virginia looked forward to basking in the warm Mediterranean sun and tending to her troublesome companion, “Cuthbert,” before meeting her British colleagues at the consulate. But on arriving at the station Virginia made a mistake, unusual for a seasoned spy. She arrived far too early–4:30 AM for the 5:15 AM train to Barcelona–and the police were waiting. Without an entrance stamp in her passport, the police knew Virginia crossed the border illegally. Virginia was thrown into Spanish prison.